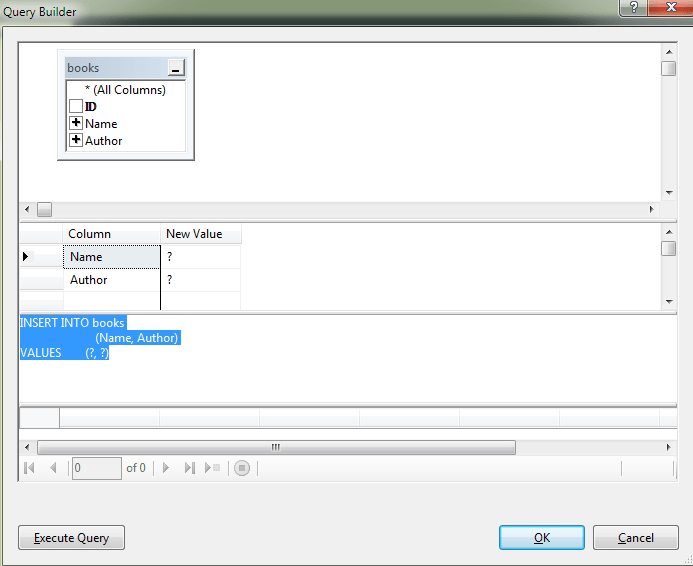 Retrieving the value of an identity column from a record in a database table after inserting it may sound ridiculously simple (and it is), however if you google for it you will find that people often have problems with it when using ADO.NET, specifically if they are not using SQL Server. This might seem to work, but given enough time it will bring you problems because between the Update, the Fill and the retrieving of the ID of the last record many things might happen in a concurrent environment, namely another row might get inserted or the row you’ve inserted might have been deleted. If you are using SQL Server everything works great you’ll probably never have to worry about this. However, if you are not, and my personal experience is with MySQL, specifically using MySQL with the ODBC connector, the wizards of Visual Studio do not help you as much as if you were using SQL Server. If you are not interested in resorting to stored procedures to solve this problem, read on. But before we go into the solution, let’s just look at how what gave this post it’s title. The auto-generated ID columns whose values we so desperately want to get. First let’s look at the ways you can get the generated ID for an inserted row in SQL Server. The need to understand this next part will become clear at the end. Trust me. “For example, there are two tables, T1 and T2, and an INSERT trigger is defined on T1. When a row is inserted to T1, the trigger fires and inserts a row in T2. This scenario illustrates two scopes: the insert on T1, and the insert on T2 by the trigger. This is all from the msdn documentation. Assuming that you are using a strongly typed dataset, in this case that’s BooksDataSet, and you used the wizzard to generate that strongly-typed dataset and the corresponding table adapters. 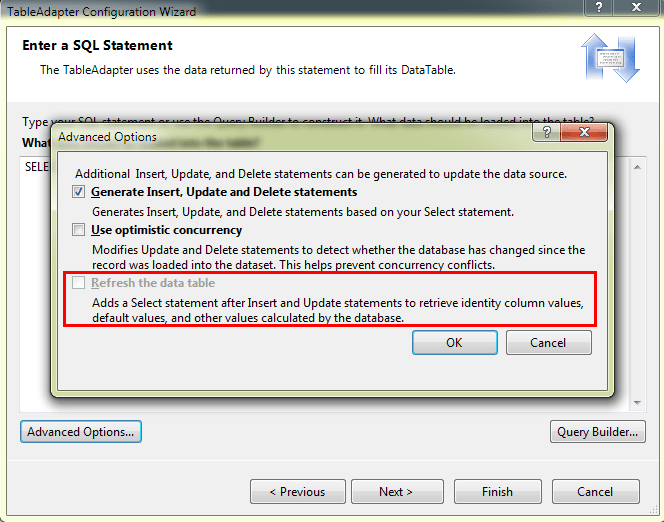 If you are using SQL server as your database that will print the new ID value into the console. If you are using another database, chances are that won’t be the case. And when you press OK you’ll get a warning stating “Unable to parse query text.”. Just click ignore. If you did not TL;DRed by now, here’s why it’s important to be aware of the intricacies of IDENTITY, SCOPE_IDENTITY (SQL Server) and LAST_INSERT_ID (for MySql). For this particular scenario it should be clear that you should use SCOPE_IDENTITY (and this is assuming that you need to fiddle with the auto generated commands for some reason) because if you use @@IDENTITY you can get an autogenerated ID for some other table where a record has been inserted, and this might very well happen given sufficient concurrent writes happening at your database. 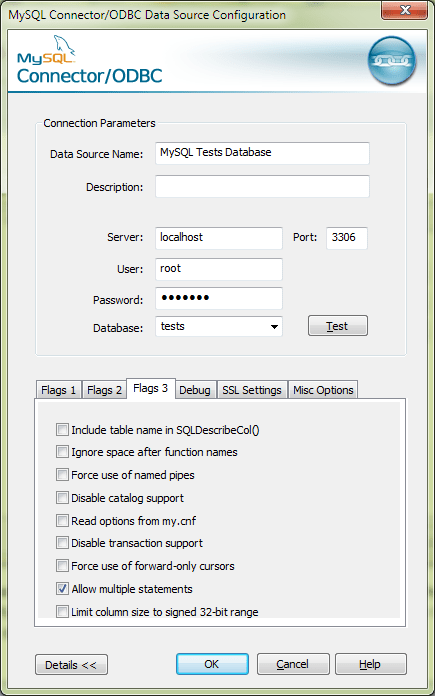 LAST_INSERT_ID is the only alternative I know for MySql.